Hi, I am interested in your 1955 Ford Fairlane (stock #4656-ATL) listed on Autotrader for $24,995. I'd like to get more information about this vehicle and confirm its availability. Time to cash in on the fact that 50s Fords are a screaming bargain compared to their Chevy competition. 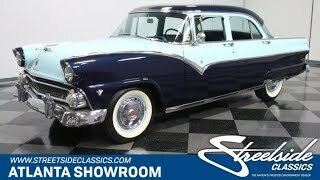 Take this wonderful 1955 Ford Fairlane for example, which offers 50s chrome and two-tone flash, a great-running V8, and enough room for your entire family, all for a price thats thousands less than a comparable Chevy. Despite the lack of any documenting records, a full restoration was obviously completed not long ago, and its been accurately finished in Sea Spirit Green over Waterfall Blue, just like the door tag says. Styling is instantly recognizable, without the usual excesses that defined the era. All four doors fit well and the paint has the perfect pastel look that suits the vintage Ford to a T. Perhaps the most dramatic element of any Fairlane is the sweeping stainless trim that divides the colors, stretching from the leading edge of the front fenders all the way back to the taillights. As you know, the chrome and trim on any restoration can be shockingly expensive, but they didnt hesitate and made the investment on this Fairlane, which offers bright bumpers, a crisply rendered grille, and lots of glittering stainless. In addition, the wrap-around windshield, the emblems, and the distinctive round taillight lenses are all in excellent condition. The inviting two-tone vinyl interior offers seating for up to six and plenty of style and color to satisfy even the most ardent fan of the 50s. The seat covers are in excellent shape front and rear, and plus matching carpets give the Fairlane an upscale feel inside. Thunderbird fans will find the dash familiar, with a domed instrument cluster with bright, clear markings on the clear Plexiglas lens. The simple steering wheel has an excellent emblem and horn ring, and youll especially like the three round dials in the center of the dash that house the heater/defroster controls and clock. And despite the Fords rather compact, trim proportions, theres a massive trunk that will easily carry a weeks worth of luggage for your entire family. Theres also a correct mat that might very well be original, as well as a bias-ply spare tire on one of the original steel wheels. Power comes from the optional U-code 272 cubic inch Y-block V8 topped by the original style intake and 2-barrel carburetor. The engine bay is very impressive, restored to a level that matches the workmanship on the rest of the car. Fresh orange and black engine paint clings to the block, and the stylish valve covers show good, bright Ford decals that are the highlight of the engine compartment. However, for all its originality, it runs superbly, with a smoothness and polish that only a restored-to-original car demonstrates. The 3-speed transmission shifts neatly and theres a 9-inch out back with highway-friendly gears. Its solid and restored underneath, so you can see that this is a good car with no needs and you wont have to think twice before taking it out on the road. A set of four C78-15 whitewall tires have been installed on the original wheels with beautiful wheelcovers. A comfortable, flashy, smooth 50s cruiser that looks great and remains eminently affordable. What a great way to show up at the next cruise night. Call today!